It is becoming increasingly common for couples to look more closely into the ethical credentials of their jewellery. 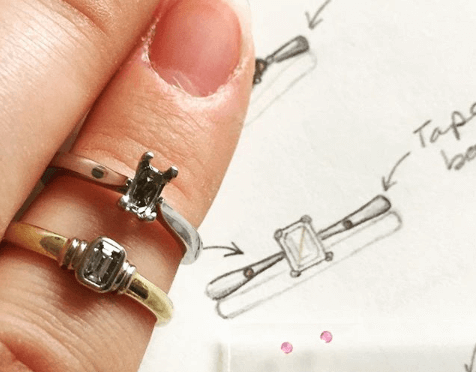 Going the bespoke route can make people feel more comfortable about the provinence of their jewellery as there is often a strong relationship between an independent jeweller and their suppliers of metal and gemstones. One ethical route that some of the customers I have worked with have taken is to recycle a gemstone for their commissioned piece. Using a pre-owned stone means that there is no fresh environmental impact as a stone is not having to be mined and cut specially for the piece. This can add a layer of enjoyment to having a piece of jewellery made as there is no guilt or concerns about the ethical and environmental impact of sourcing the materials the piece is made from. Quite often, these recycled stones come from inherited pieces of jewellery, which adds another layer to the process of having a piece of jewellery made. It adds to the history and story of the piece and can act as a talisman to the wearer. When cared for, there is no reason why gemstones cannot have an infinite lifespan, so why not have them re-designed into new jewellery and create a new piece to pass on to future generations? One of my most recent commissions using a recycled gemstone was this platinum and diamond engagement ring I designed around Dan’s mother in law’s diamond. 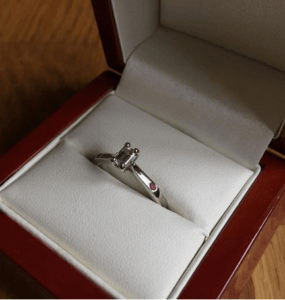 She gave him her engagement ring so he could use the diamond in a new ring to propose to her daughter with. 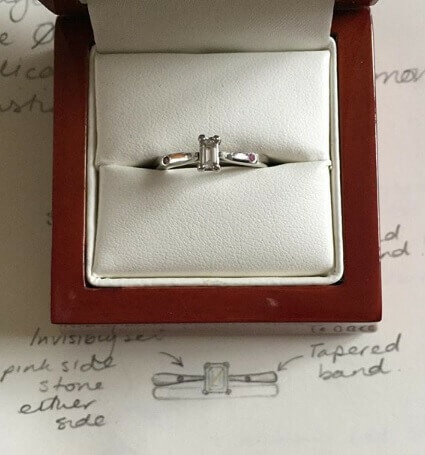 This has a real poignancy as it gives a real sense of Dan’s mother in law approving of the engagement and wishing the couple well by gifting them the diamond. The history of her relationship within this stone carries a weight with it that I am sure will resonate with the couple and make the piece even more special. Dan’s Mother in law Sharry’s diamond is a gorgeous emerald cut, which means it has long, almost striped facets rather than lots of tiny facets at multiple angles like a round brilliant cut diamond. It has an almost Art Deco feel as this cut was used a lot in the early 20th Century. 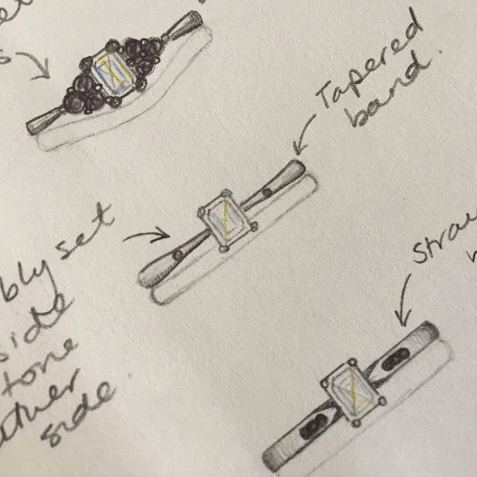 Sharry’s ring, although very pretty, just doesn’t suit her daughter’s style, so we designed a much more contemporary band to house the sentimental stone. I was given some basic information to base my ideas on and I produced three initial ideas. I knew that platinum was the metal of choice, and that some pink should be included somewhere in the design. The first idea is based on a design Dan had seen online with a different central diamond shape. It is a twist on a cluster design with three pink sapphires set in small claw settings on each side of the central diamond. The second and third designs provide some options to include the pink colour in a more delicate style to suit Dan’s petite girlfriend. Dan and Sharry quickly selected the second option but we played around with different setting styles before coming back to the original claw setting in my sketch. Sharry had concerns about the durability of a claw setting, but her mind was put to rest when she learned that Platinum is the strongest of the precious metals. You can read more about Platinum here. 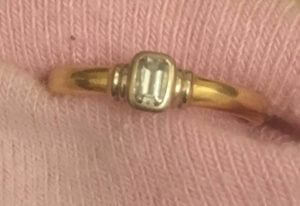 This photograph documents the final moments of Sharry’s ring in its whole before it had its diamond removed and set into the new ring, alongside the pink sapphires in the shoulders. The new setting allows more light to flood into the stone from the sides, which were previously hidden with an all-around setting. It also makes the diamond look larger as more of it is visible. 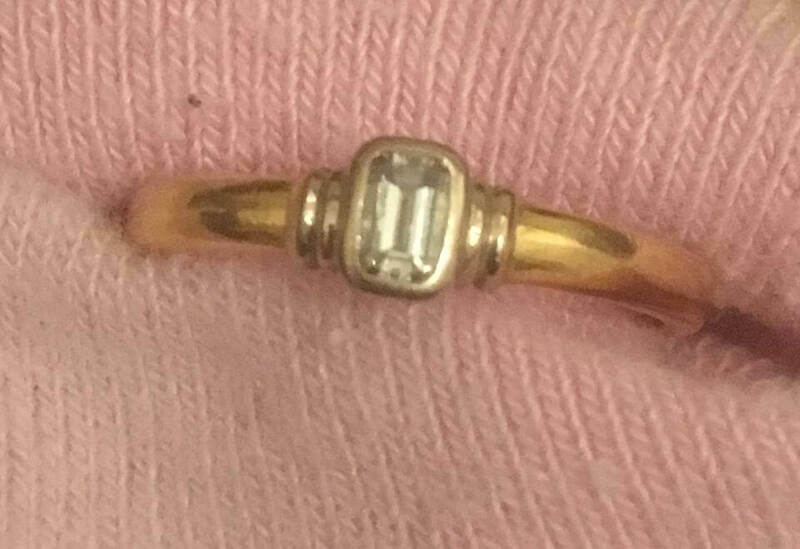 If you have a sentimental or unworn piece of jewellery that you’d like to use as the basis for a new and environmentally friendly design, get in touch via the contact page – I’d love to help you realise your ideas!